I have fallen in love with Lublin. This city feels like I imagine Poland did before the last World War, when the soul of the country was fractured. It always makes me sad to think how much culturally richer, healthier and more robust Poland would have been had all that not happened. When I go to Lublin, I realise that Poland’s spirit is still intact, still shining in a few special places. Lublin is one of these exceptional places and the city celebrates it’s soul in a myriad of festivals throughout the year. On my first day there, I was honoured to be judging over 70 regional specialities, which gave me the unique opportunity to experience this culturally rich and diverse region through it’s food. 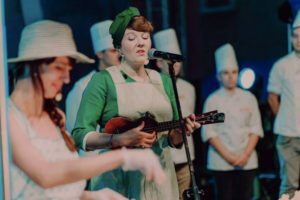 The biggest privilege was tasting things from Polish homes – many dishes were made by people who have nothing to do with the catering industry and their specialities are not widely available. In Poland so much of the cuisine is hidden away that unless you are invited into someone’s home you will never get this opportunity to taste the real Poland. This is something that makes this country both special and frustrating at times (for a foodie like myself). All the good stuff is not easily accessible. Some of the tastes that define the region and that stuck out during the tastings were sweet pumpkin purée, which reminded me of the French marron spread that you can spread on pancakes and toast. A delicate, white fish “pie” that looked more like a cheesecake at first sight. Numerous “nalewki” – I had to try about 20 in one day (it’s a hard life) so I was a little “overwhelmed” (read “drunk”), but the ones that stuck out for me were the wild cherry and mint and the fragrant honey nalewka. Delicious dumplings filled with what tasted like meat but were in fact vegetarian (the filling a mixture of wild mushrooms, seeds and sauerkraut I presume, but the creators only smiled slyly and kept shtum). Then there was the “gryczak” – definitely a 5 out of 5 – and something I decided to make at home, because of it’s versatility. 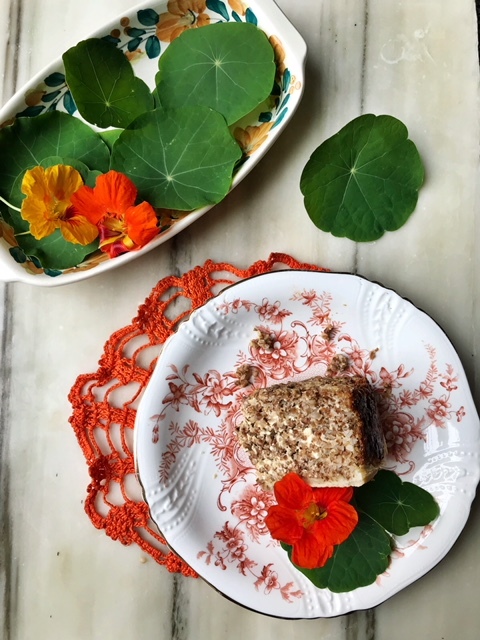 It’s basically a toasted buckwheat pie, so it can be served on it’s own as a snack, with a meat or veggie stew, or even just with some roast veg, as we are eating it today. It can be served warm, cold and is delicious fried with some soured cream too! Whilst in the region I also ate round pierogi filled with buckwheat, which were called also gryczaki. The Lublin region is known for it’s kasza gryczana because it’s mostly grown in this area, it’s therefore the most local source of carbohydrate. I love that smoky and malty taste myself too and people I introduce it to from other countries are always intrigued by it. It’s the toasted buckwheat I’m talking about here – the dark brown stuff – which has such a unique taste. You can buy it from any Polish shop, it’s called “kasza gryczana prażona” – it’s best to write it down and ask at the counter, as Polish is very difficult to understand when not pronounced properly. You can also replace the twaróg in the recipe with or another white cheese such as ricotta if you are having any difficulty getting it (every Polish shop should have it, but whenever English people go in there, they tend to come out with something odd, like blended twaróg for cheesecake or something). The recipe is flexible and you can add more cheddar if you wish (not a traditional ingredient of gryczak I admit). We ate our gryczak with a salad of nasturtiums as you can see in the picture – a wonderful combination! 50g of grated hard cheese, such as cheddar. First, cook the kasza in the milk – bring it to the boil, then cover and cook on the lowest heat until all the milk is absorbed. This should take about 20min. Then turn the heat off and leave to steam for a minimum of 20min. Add a knob of butter towards the end of steaming and fluff with a fork. Chop the butter into bits and blend into the flour with your fingertips. When it looks like breadcrumbs, add the water and kneed into a dough. Place this in clingfilm in the fridge for about 20min. Grease a baking tin with butter, then place the pastry in the bottom on the dish. Some people line the whole tin with it, but I don’t feel that it needs that much dough. Bake for 15min at 180 degrees C.
In the meantime combine the kasza with the cream, mashed twaróg, marjoram and eggs. Season to taste. Place the filling on top of the pastry and bake for about 45min on 180 degrees C.